Will Phileas Fogg win the bet in making it around the world in 80 days? 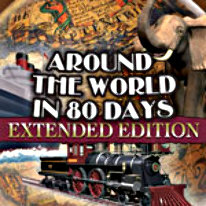 Inspired by Jules Verne's novel, "Around the World in 80 Days". The bet is on: a Phileas Fogg, British gentleman, is to make it around the world in 80 days. Jean Passepartout, his French servant, is going with him. But Fix, a police inspector, has to keep close track of the travellers, as they are suspected to be the thiefs of the Bank of England. Will Fogg win the bet? Help him surmount the obstacles!